Home » Travel Hacks » Travel Tips » What Have You Got in All Those Bags? Two phrases we have heard continuously on our travels. We hear from the long-term travelers about how much luggage we have and do we really need all that stuff and then we hear from the holiday travellers who travel with twice as much for a week or two, about how little we have. In the end we are not in competition with anybody, we simply carry what we can and what we use. In Asia it was a lot less. It was hot all the time so our third bag filled with winter stuff was never opened and really could have (and should have) been left behind. When we got to the US it was a lot more. Not only was the shopping better, but it was cold when we arrived and we had to buy, not only jackets, but scarves and gloves and snowsuits! Wow, those things are bulky! We left Australia May 2012 with 3 large suitcases, 3 small carry-ons and a backpack. We left Asia November 2012 with 2 large suitcases, 3 small carry-ons and a backpack. When we left Australia we took everything we thought we would need for a year. We never contemplated how much of it we wouldn’t need when spending 7 months in Asia in hot temperatures. In Bali I could have lived in my swimmers and sarong or shorts and t-shirt. So we decided to re-pack based on what we wore and one bag remained unopened our entire trip through SE Asia – do you know how much money that costs to cart around on planes when you are charged per bag? That’s right, a lot. We could have probably repurchased this stuff when we needed it in the US and saved a lot of money. When we left Asia we had dwindled our stuff down. The kids had grown out of shoes and clothes, clothes had been worn thin and while we were in Manila during the floods we felt compelled to give a lot of stuff to the relief fund. We sent some items back to Australia with friends and family members who visited and finally were relieved to throw away one whole bag. Fast-forward to the US where we could buy proper clothes again. Then we got to Las Vegas and it was freezing, we anticipated New York to be worse. The kids jackets just wouldn’t do, they needed snow suits. None of us could wear thongs any more (in fact I had refused to buy new shoes since I love my thongs and was forced to wear my sneakers everywhere in the US – argh, the horror!) Then Christmas came and the kids were ambushed with beautiful, thoughtful, bulky gifts. We ended up buying a new suitcase and we were back to 3. When we left the US our bags looked like this. We had re-packed them several times and decided we would not need warm clothes or other items for our trip to Central America. Generously our relatives had a condo in Miami so we left 2 large suitcases there and, with great relief, hopped on our plane to Mexico. So what is in all those bags? Well, you now know the ones left behind are filled with winter clothes, some with dressy clothes and some with Christmas presents. But what about the ones we are travelling with at the moment? 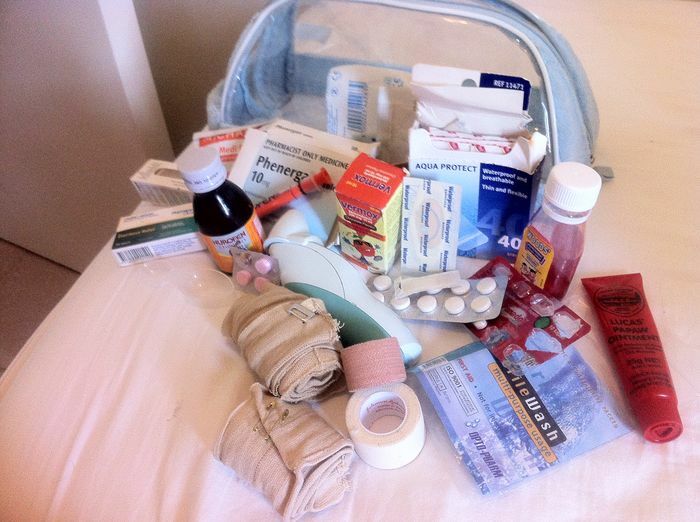 Yes you can buy medicine all over the world. But no, you can not anticipate the need of some items and to have time to find a pharmacy in an unknown country, get there via public transport and back before the child screams the house down. Sometimes we have fewer items (no nurofen in some countries). Sometimes we have more (ear infection drops). Our kids’ Dora-styled bag is filled with toys. We don’t want them to miss out on their fun so we allowed them this bag. They can fill it with whatever they want. If it doesn’t fit, it doesn’t come. If they get something new we encourage them to throw/give away something old. Over Christmas this bag nearly doubled so we are hoping that a lot of the current items in it can be given to some children here in Central America to play with. Leap Frogs pen and books – for reading by themselves. Best road trip entertainment ever hands down. Teddies – Both kids have 2 sleeping toys. They have not managed to get lost yet like I hoped. The bag back in the US has several other soft toys they received as gifts, not sure what we will do with those giant space-takers. Reading & writing books – for Mia to practice her letters and numbers. Includes a jam-packed pencil case (new textas & crayons thanks xmas). McDonalds toys – these are great travelling toys. They are cheap and they break quickly, which means toss and new toy (if you can get the kids to toss them). Camera – Mia’s new Xmas present, she loves taking photos, but it’s a bit bulky. Books – a few favourites from home that we have resuscitated with sticky tape several times. We have introduced iBooks on the iPad now and it’s a great alternative (and adds no bulk to the suitcases). My carry-on is usually filled with food, nappies, wipes and a spare change of clothes for the kids. 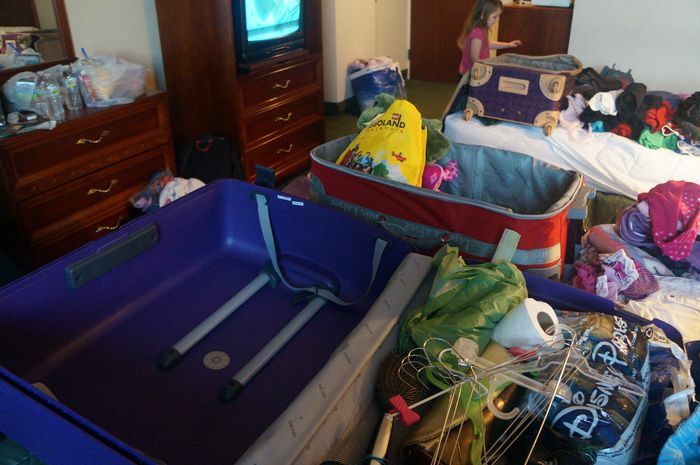 It always amazes me how fast the room is taken up with all of the kids’ stuff. No room for my stuff in here. We usually jam this bag filled with cables and electronics. This bag has recently flowed over into the backpack so while in Guatemala we have gone through all these cables and whittled them down. We had a lot of cables that weren’t being used but the IT guru couldn’t leave behind in Australia. I hope now that he has sorted through them they don’t creep back in. This is Josh's baby. It's home to all our electronic gear, laptop, cables, camera, etc. This is used only when in transit and is attached to his body like a bullet proof vest. Our large suitcase is filled with clothes for all of us. The kids’ stuff takes up more then half the space since they go through their clothes faster then us. Josh’s size 15 shoes also take up a lot of room and he has had to sacrifice his shoes because of their space. I could fit 5 pairs of thongs for his 1 pair of sneakers. We also carry our first aid kit in here, our toiletry bags - 3 of these with shampoo, conditioner, detangler, razors, shaving cream, body wash, a tiny bit of makeup, deodorants, etc. And sometimes our food staples. So there you have it. 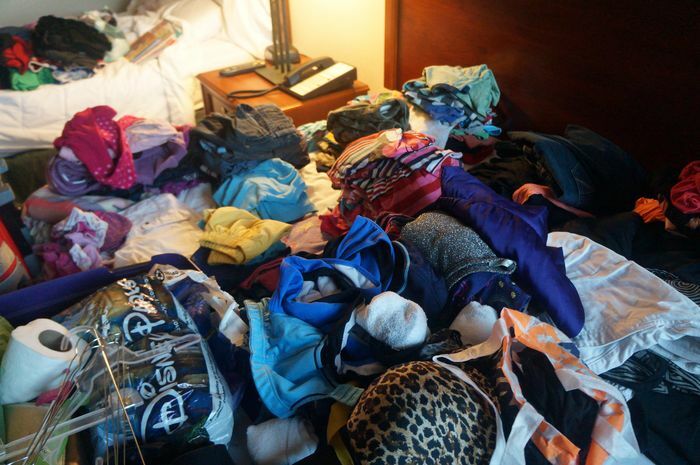 That’s the answer to “what have you got in all those bags?” and a peek into the suitcase of a travelling family. If you asked us when we lived in Australia if we could have lived out of 1 suitcase and 3 carry-ons, we would have said “no way”. But now it’s a different answer and definitely for the better. Well sometimes, I still miss my shoes. HeHe! I don't think that's actually that much more than we'll have, 2 big backpacks (72l and 60l) and the kids have got a 18l pack each. Plus I'll have a carry on bag for my laptop and so will James. 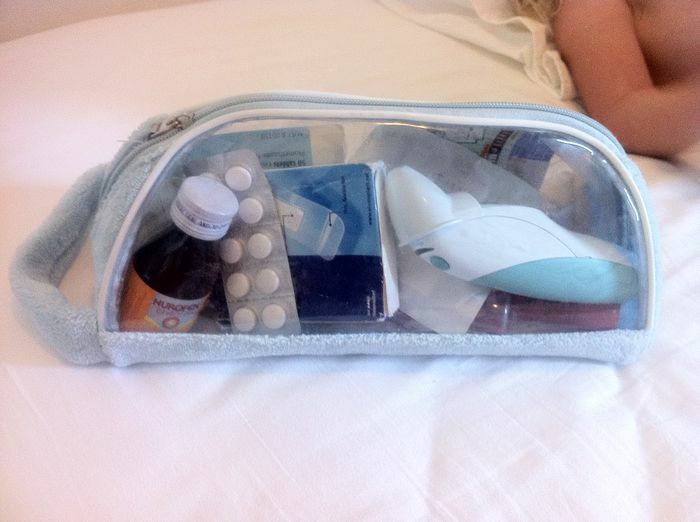 My handbag fits inside the laptop bag, if an airline is sniffy about handbags, some are. I'll do a similar post of my own soon, I love looking at how much stuff people take! 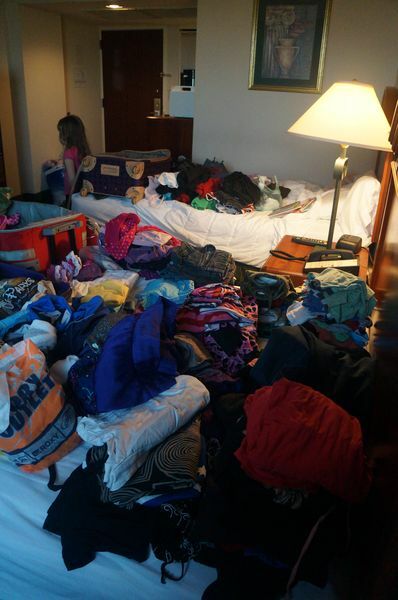 we only need one suitcase for all of our clothes and toiletries, and then the other one gets filled up with kid junk - amplified with a baby - baby cot, high chair insert, nappies x lots (and wish we had brought more as we cant get any here big enough for our daughter). we even left home with 5 tins of formula! at least that is down to 2 now. at least it gives me hope that the amount will be a bit better next time! Read through the whole thing... Consider me impressed! Love hearing what you pack! I always love hearing how other people pack. You definitely have to have room for those climate change purchases and the like. I've just discovered your site...fabulous! We are planning our 6 month stint in Europe April to October 2014 with our 2 boys, 5 and 3 1/2. What are your thoughts on strollers. We would like to do without but we like waking everywhere and little legs get tired! Will continue reading about your travels...thanks for sharing!